Vinyl Digital Exclusive - Limited Edition of 300 Copies! Includes Free Digital Download Code. Housed in special Picture Cover with middle hole. Includes a Bluestaeb Remix - Mastered by Figub Brazlevic! From nine to five, from five to nine. As soon as the dayjob is done, the formal shirt is replaced by a hoodie – buttons get pushed rhythmically. Nighttime brings out the Mr. Hyde in Dr. Jekyll and the S. Fidelity in this Swiss boy living in Berlin. 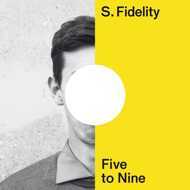 With his first EP "Five to Nine" S. Fidelity carefully compiled a small collection of gems kept secret – until now. Over the course of 8 tracks, he showcases a wide variety of styles, ranging from laid-back instrumentals to rap and futuristic neo-soul. For the completion of his debut EP, the 22-year-old beatmaker joined forces with the Berlin singer LaNó and Tokyo's Tajima Hal on one track and Rob Really from Moontroop featuring on a second one. The features add a complementary touch to S. Fidelity's compositions and thereby contribute to the complete range of his sonic spectrum.